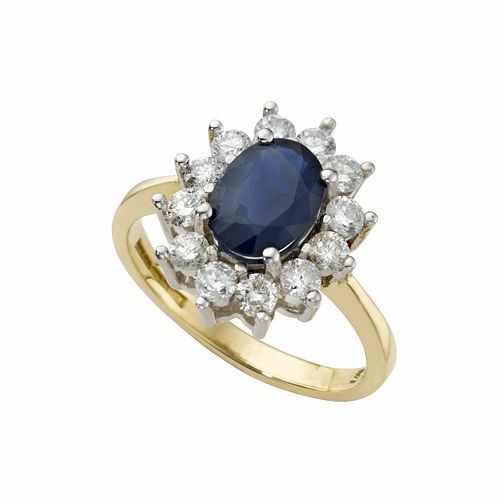 This striking antique-style 18ct gold ring features an oval-shaped blue sapphire surrounded by sparkling diamonds. Similer to the timeless style of Kate Middleton, this beautiful ring perfect as a gift or as a token of your true love when asking that all important question. 18ct gold sapphire and two third carat diamond ring is rated 5.0 out of 5 by 2. Rated 5 out of 5 by Anonymous from Simply beautiful My husband bought this ring as a replacement engagement ring for my Christmas present. This ring is absolutely stunning and the picture does not do it justice. The sapphire is bright blue and the diamonds are sparkling. Rated 5 out of 5 by Anonymous from Beautifull Ring I was very lucky my husband bought me this ring for our 40th Anniversary as i love Sapphire rings and it's also my birthstone. This ring is absolutely beautifull and a joy to wear. I get so many comments about it when i wear it and i cant stop looking at it on my finger. If you buy this ring you will not be dissapointed.